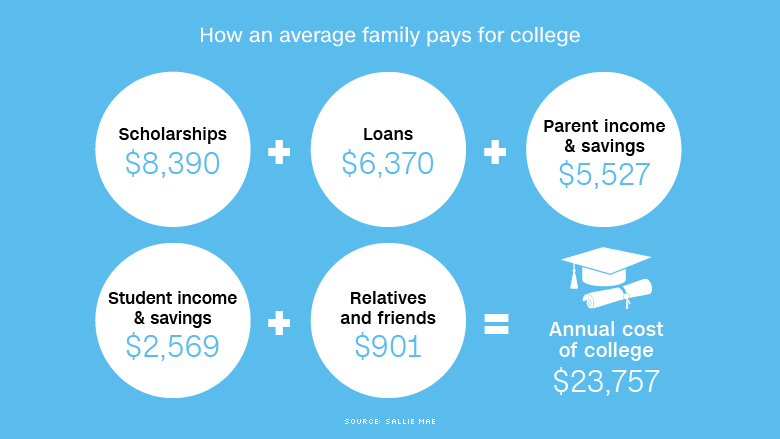 Figuring out how to pay for college might not be as daunting as you think. Sure, the financial aid system is complex and tuition gets more expensive every year. But the good news is that parents aren't footing the entire bill themselves. In fact, nearly half of students received some kind of scholarship last year, according to a new survey from Sallie Mae. For most families, that free money covered a significant amount of the bill. There are three main funding sources families draw on to cover the cost: scholarships, income and savings, and loans. Each source covered roughly one-third of the bill for tuition, fees, and room and board. Luckily, the largest source of money was scholarships and grants -- which do not have to be paid back. They covered around 35% of the tab for the average family. About 87% of students who received a scholarship last year said they received one from their college. About 75% of them got scholarships from private sponsors and community groups and 65% received money from a state program. 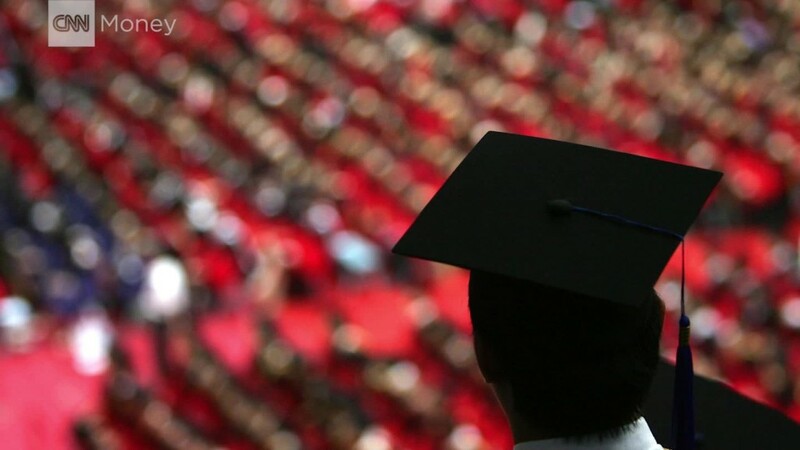 Students and parents who took out loans borrowed enough to cover 27% of the cost, on average. Most students borrowed from the federal government's low-interest student loan program. Freshmen are allowed to borrow up to $5,500 a year in federal loans, and the cap rises $1,000 annually for the next two years. For those who need more money, many turn to private lenders. These loans usually come with higher interest rates that are based on your credit. Parents should be prepared to sign on as a cosigner. Parents can also borrow from the federal government's Parent PLUS loan program, if the qualify. But they might be able to get a lower interest rate from a private lender. A small portion of parents used a credit card, a home equity loan, or borrowed from their retirement accounts. Parents used their own income and savings to cover about 23% of the cost. Of those who used some of their own money, they paid an average of $5,500. Most primarily used their income. About 13% used money they had saved in a college savings plan, such as a 529, and 8% used money from others savings or investment accounts. Don't underestimate what your child can contribute. On average, they had enough in income and savings to cover 11% of the cost of college last year, or about $2,600. About half of students surveyed said they paid some of the bill. About one-third used their current income and one-quarter used their savings. Other family members and friends chipped in an average of 4% of the college cost. To reduce the impact a gift from a generous grandparent or aunt has on the amount of financial aid a student receives, ask them to contribute the money to a 529 plan in the parent's name.